I’ve connected the Arduino pro mini (328/5V) to my pcb. Of course it’s not directly soldered to the PCB but using a connector, so I can replace the parts that get bricked during development. I’ve downloaded the blink example using something like this. Directly after flashing it worked, but once I disconnected the flashing adapter it stopped. After remembering, that I’ve to short my optional filter in case it’s not assemble it works. 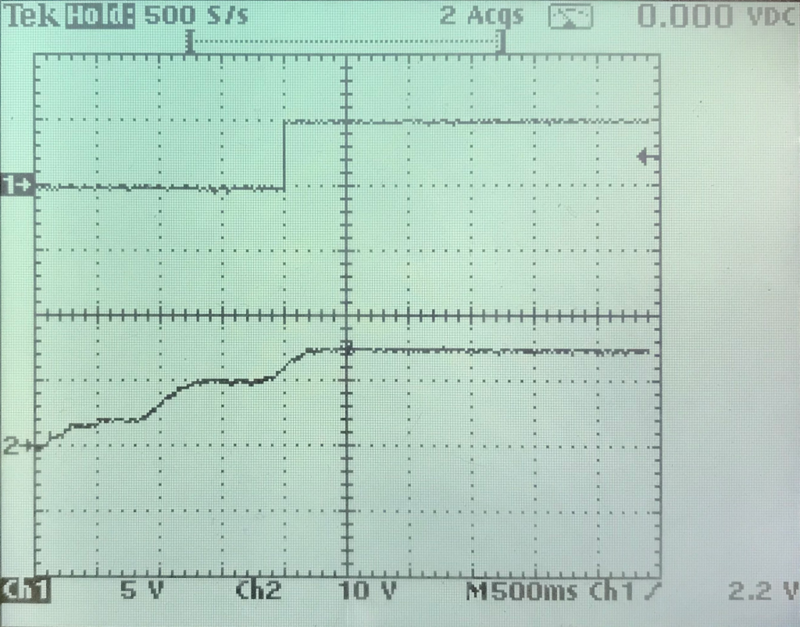 … an ohmic load (Thank you Axel) shows the same behavior (spikes on Vout) as seen in the previous post. Fortunately I’ve spent some space on the pcb for an optional filter that has now become mandatory. 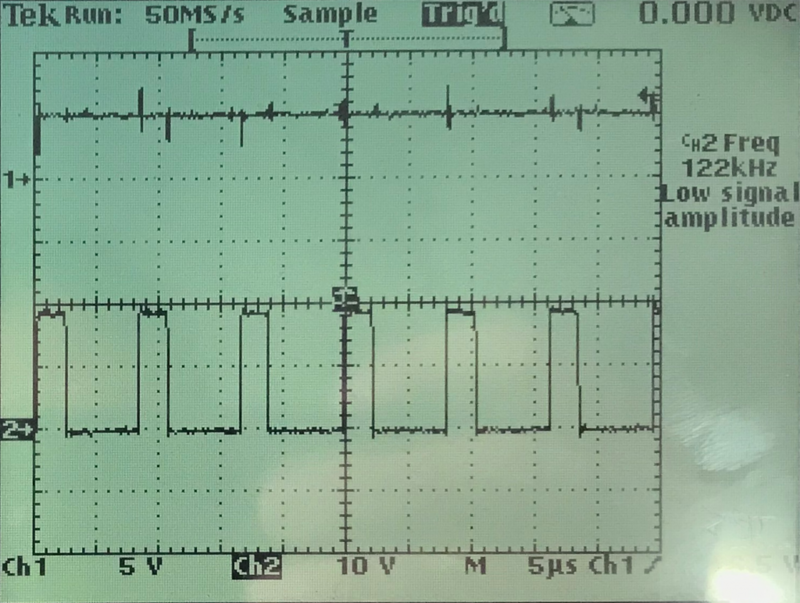 The spikes do not change with load or input voltage. I took a closer look and they are much less random compared to what the screenshot looks like. They’re expected transient responses to the switching. currently they’re around +- 1,5V which is too much. Unfortunately the additional inductor and capacitor for the filter where not part of the part delivery I’ve received. The delivery date is changing once a week and is oscillating around 30th of march. But in the meantime I still can try to get the arduino running. It has it’s own voltage regulator and an additional capacitor at the input, so the currently “dirty” Vout will not be an issue. The load was a florist wire that accidentally had the correct length to have a resistance of 10 Ohm (Just in case: R=U/I). So in addition to the resistance it also is an inductive load due to the geometric nature of florist wire.I did not want to unwind it. There are spikes on Vout (Channel 1). They correlate with the switching points of the buck and are most probably caused by the “coily” nature of my florist wire load. The result of the short test is that I’ve not noticed heating on the pcb or the parts even though I’m running the circuitry at the upper boundary of what it’s designed for. That’s good. For a real test with reasonably long duration (> 1 day) I need a fire proof environment, that also contains the designated housing, so that air turbulence can not cool down the pcb and of course a possibility to measure and log the temperature over time. After a (luckily unsuccessful) search for short cuts I have connected the power supply part on the pcb to an external power supply. The following screen shot shows that the power supply becomes operational at around 12V. Unfortunately I do not have a nice load to check the behavior close to the 0,5A the power supply is designed for. But I have small light bulb that causes a load of around 30 mA. Running the power supply at this load for some minutes did not cause any noticeable increase of the temperature. That’s a good sign. I also tried a short cut between Vout and GND. Nothing bad happened. The MAX5033 detected the short cut and shut off, before trying to start again. After removing the short cut it went back to normal. This state I did not try for a longer time. The effects were visible on the oscilloscope and audible. Typically the inductors start to “sing” under such conditions. My external power supply can only provide 20V, but I assume, that if everything works at 20V it’ll also run at 24V. So the next step before actually connecting the arduino is to run the power supply for an extended period of time (~ 1 day) with high load and 24V input. After a long time I’ve reactivated my solder iron. Since I’ve done that without additional flux (apart from the content of the solder) the result looks accordingly. My next step will be testing the circuitry. Surprisingly for me the soldering of the IC was the easiest. I assume, that the pads were perfectly sized for hand soldering. The resistors and small capacitors look horrible because I did not use tweezers. 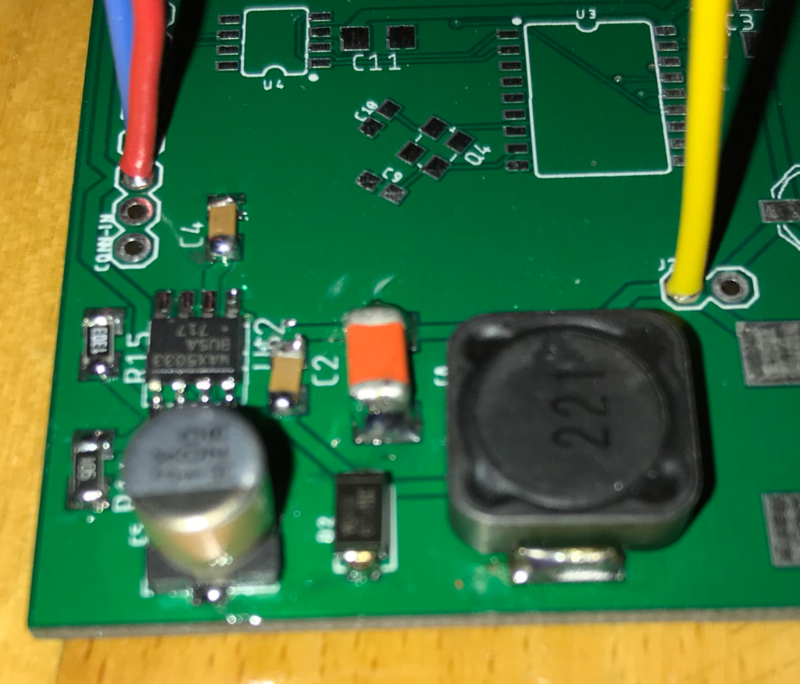 The large capacitor’s solder pads are a bit too small for hand soldering and the inductor needs a higher temperature because of the relatively high mass. I also noticed that I’ve to improve my documentation. More information on the pcb, the layout and the circuit diagrams are required to simplify the soldering and reduce the time spent on searching the parts and their orientation. For example having the small dot that indicates pin 1 of an IC would be very helpful. Also the orientation of the larger capacitors and the exact location and size of the text on the pcb. After ordering the prototype pcbs in China on Saturay they arrived on the following Wednesday. I even got one more pcb than I’ve ordered. The service is very fast and the price more than acceptable. So based on this single sample I can recommend allpcb.com. Apart from the silkscreen, the pcb looks good. But I’ve put exactly zero effort in it, so it’s OK. The picture shows the Arduino pro mini plugged in, but not yet soldered. The next step is to solder the power supply parts (visible here on the very right) and the optional filter against ripple. After that the difficult part, soldering the oscillator, will be the next step.